Do you remember each of the 7 churches of Revelation? These churches mentioned in Revelation chapter 2 and 3 represent different struggles and strengths of the Christian church today. Here is a short overview of each of the 7 churches of Revelation, plus a description of Patmos, the place John actually received the Book of Revelation. To visit these 7 churches and the island of Patmos, join us on a luxury Christian cruise and Bible study tour. Ephesus, The Loveless Church: The people in Ephesus were hard-working people who endured and hated evil. From the outside, they may have looked like they had it together but their hearts were wrong. The 2 greatest commandments are to love God and love people (Mark 12:30-31) and Ephesus was missing this single greatest component of all Christianity. Love. Smyrna, The Persecuted Church: There was no rebuke for this persecuted church. Although they were continually under physical hardship, the people of Smyrna were promised that they would not be hurt by the second death. They were encouraged to stay faithful, even when facing physical death. Pergamum, The Worldly Church: This church was the tolerant church. Although they refused to deny Christ, they allowed sin like idols, immorality, cults and heresies to remain among them. Thyatira, The Wrong Doctrine Church: The church of Thyatira had love, faith and good works. They were even patient people who were eager to grow. Where they fell short was their doctrine, which was infiltrated by idolatry, sexual sin and pagan traditions. Sardis, The Spiritually Dead Church: Almost all of the people in the church of Sardis had fallen asleep spiritually, except for a small remnant of believers. The Dead Church was encouraged to kindle and revive any small bit of faith they had left. Philadelphia, The Spiritually Alive Church: Philadelphia did well. There was no rebuke for this church of faith. They kept the name of Jesus and never denied it. There is a promise in the kingdom of heaven for these Christians. Laodicea, The Lukewarm Church: The church of Laodicea, unlike Philadelphia, only received rebuke. They were neither hot nor cold as we read in Revelation. Their reliance on riches and things of this world resulted in a lukewarm, halfway-in type of Christianity. Bonus! Patmos, Where John Received Revelation: The book of Revelation, written by John describes the apocalyptic ruin of the world and the triumphant battle and return of Jesus Christ. This island is best known as the location where John actually received the visions that led to him writing the book. The actual cave where historians believe John was when receiving Revelation can be seen today. For more information on these churches, check out this great commentary from biblegateway.com on “The Seven Messages”. If you would like to see these places for yourself, we offer one of the most complete opportunities offered industry-wide to learn not only about the book of Revelation but also to trace the path of John as he transcribed his visions for the rest of the world to read. 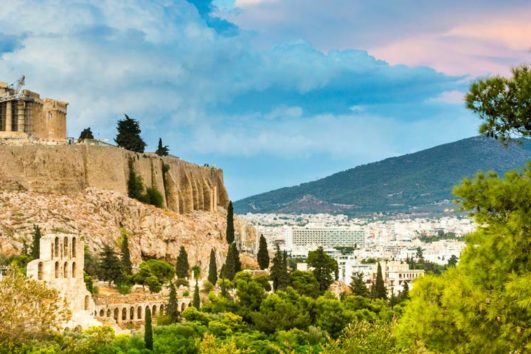 In addition, you’ll visit other popular sites including Greece, Turkey and Corinth. See the Parthenon in all its glory and the man-made wonder known as the Corinth Canal on a “Footsteps of Paul” Christian cruise. Additionally, you can find your ideal Christian tour with Living Passages & begin planning for an unforgettable experience!